For St. Patrick’s Day, I had what I thought was this great idea — a Jell-O poke cake with white cake mix and green gelatin. It was perfect! Sort of. And by sort of, I mean if you like the flavor of Carmex or maybe the flavor of what a newly cleaned bathroom would taste like. We ate one piece and tossed it, which is not to say I won’t make another poke cake, because I think raspberry or strawberry gelatin would be much better than the lime, which was just weird. So I had so much fun making the poke cake I decided to make another one. Specifically, a pudding based one made with a scratch cake base and instant chocolate fudge pudding. It went over well and I was so enamored with poke cake I made a third. 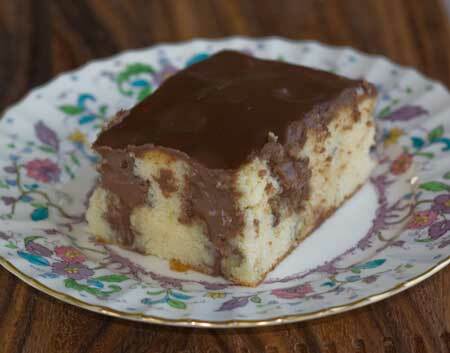 The last, at least for now, being a scratch cake with a chocolate pudding topping. The scratch poke cake was great, especially the base, which unlike the cake mix version, wasn’t mushy but firm and perfect with the pudding. The pudding recipe was a no egg cornstarch based recipe, but I think it would be equally good with Jell-O cook-over-the-stove type pudding or even instant. blah, blah, blah. Here’s the recipe. Don’t be surprised to see another one soon. I’ve got a fever, and the only prescription is more poke cake! Separate the eggs while cold and let them come to room temperature. Preheat the oven to 350 degrees F. Grease and flour an 8 inch square metal pan. Beat the egg whites until stiff peaks just begin to form — not too stiff or they’ll be hard to fold. Set them aside to wait. In a mixing bowl, using a handheld mixer or stand mixer with whisk, beat the butter on medium high speed until light and creamy. Beat in the vanilla. Gradually add the sugar, scraping the sides of the bowl once or twice and beating until light and creamy. Add egg yolks and continue beating for another minute or two, scraping sides of bowl. Reduce speed to low and add flour mixture alternately with the sour cream. When mixed, fold in the egg whites with a big, heavy-duty silicone scraper. When batter is well blended and there’s no trace of egg white, pour into the pan. Set pan on a heavy, even baking sheet and bake on center rack for 35 minutes or until cake tests done. While cake is warm, poke holes spacing 1 inch apart across the top with the handle of a wooden spoon. Prepare pudding. In a saucepan, combine all of the dry ingredients. Put pan over medium heat and slowly add the milk, stirring constantly with a wire whisk or a wooden spoon until it starts to smooth out and thicken. This will take about 5 minutes or so. Continue stirring until it starts to boil, then boil at a low heat, stirring constantly, for about two minutes. Turn off the heat and add the melted butter and vanilla. Pour half of the pudding mixture over the cake, making sure it seeps down into the holes. Continue slowly pouring the pudding over the cake until it’s fully coated. Let cool at room temperature for about 30 minutes, then transfer to the refrigerator and chill for 2 hours or until ready to serve. If you would like to have a green cake for St Patrick’s day…try a white cake mix, pistachio pudding and white frosting with a little green food coloring….and make a poke cake…yummmm, and pretty too, you won’t have to toss this one , I promise!!! Oh, I remember making a cake like this when I was little. I’ll have to try the scratch recipe as this sounds yummy! My mother first made this cake for my family when I in my early teens. My sisters and I make this cake all time now, using red jello. We don’t frost it and just put a dollop of whipped cream on each slice. It has been a family favorite for many, many years, almost as long as I can remember! It is a particular favorite for my nephews and a few of my sisters for their birthday cakes. The picture’s a little odd, too. 🙂 But definitely St. Patricks Day material. Never cared for lime jello. And I’ve never seen a recipe for a poke cake. Where have I been? I have always thought lime flavored candy and Jello tastes like cleaner. Good to know it isn’t that great in cake either. My baby’s birthday (5! ahhh!) is on Friday. He said he wants a rainbow cake, which I’ve never made. Let the searching and work begin! I’d go for chocolate on the poking, too! Anna: I know this isn’t the correct place to post but I couldn’t find a contact for you and knew you’d find it here. I received all my “loot” from the supply place this weekend. It’s all SO awesome. I can’t wait to start using them, especially the darling little chicks and bunnies for easter. Thanks so much for sponsoring this contest. Your blog is a special treat for me each day!! I think on twitter you mentioned you were going to make a poke cake, and I was so confused 🙂 (and obviously too lazy to look it up :)). Now I get it :). It is too bad that the green one didn’t work out because of the season, but I’ll take chocolate pudding over jello any day :). The green poke cake is very pretty. Too bad it didn’t taste good. I’m intrigued by your scratch version with the pudding. I have only seen poke cake on the Internet–it’s not part of the food ‘culture’ where I live, but that milk chocolate and yellow poke cake looks fabulous, and I know that as a kid it’s just the kind of cake I would have wanted as a reward for eating my green vegetables. I love the fact that the pudding is from scratch, I admit. Speaking of green–I know your husband is a big fan of pistachio pudding. Perhaps making the poke cake with the pistachio pudding and using vanilla frosting? I’ve never had pistachio pudding from scratch and don’t know how to make that, but I believe you once said he liked the Jell-O version, or am I wrong? 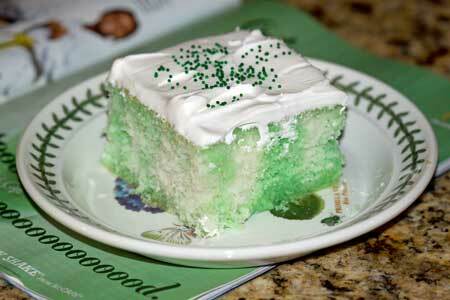 The green poke cake is very pretty, especially with St. Paddy’s Day coming up. Maybe using mojito mix instead of water to make the jello would give it a flavor other than cleaning fluid or lip balm. Too bad the green poke cake wasn’t good, because that sure is a beautiful picture! How about a pudding with a tint of light green food coloring or a mint pudding?